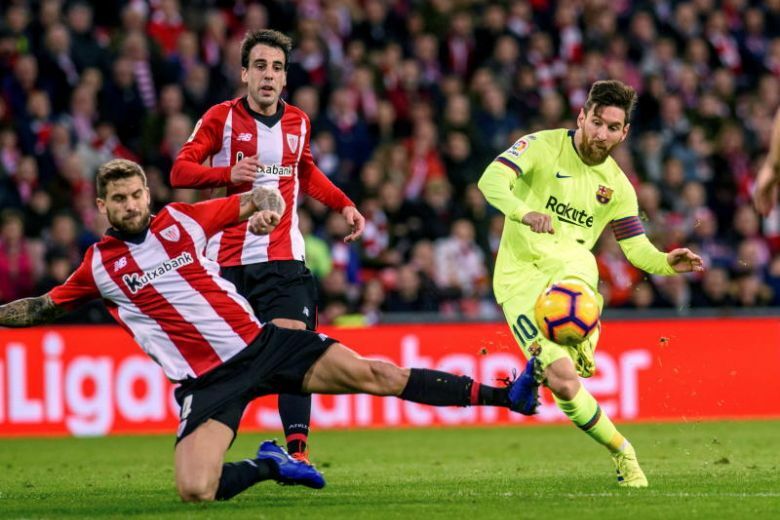 Lionel Messi was short of fitness and Barcelona lacked spark as a goalless draw away to Athletic Bilbao on Sunday offered fresh hope to their rivals in the title race. A thigh injury had limited Messi to 27 minutes against Real Madrid on Wednesday and while he played the full match at San Mames, Barca’s assistant coach Jon Aspiazu had admitted before kick-off he was not yet 100 per cent. In all likelihood, he stayed on because his team needed him but Messi was not at his best and neither were Barcelona, who would even have lost had it not been for Marc Andre ter Stegen’s stunning late save to deny Inaki Williams. The draw makes it three games without a win for La Liga’s leaders, whose advantage is still six points but now with Real Madrid their closest challengers, after they beat Atletico on Saturday. “We were first last week and we are still first, and if my maths is right, we will be again next week,” Valverde said. But Real’s victory at the Wanda Metropolitano was their fifth on the bounce and just as they have gained momentum, Barca appear to be losing theirs, at a crucial juncture, with more stern tests to come. After Real Valladolid at home next weekend, Valverde’s side travel to Lyon in the Champions League and Sevilla in the league. They then face two Clasicos in four days, one in the Copa del Rey, and both at the Santiago Bernabeu. Injuries have not helped either. Messi was picked but not fully recovered while Ousmane Dembele was fit enough only for the bench, having shaken off an ankle injury. The struggling Philippe Coutinho retained his place alongside Suarez and Messi up front but Arturo Vidal came in for the injured Arthur Melo and Nelson Semedo started at left back, with Jordi Alba suspended. Bilbao had the better of the early stages as Yuri Berchiche flashed just wide after a poor pass from Vidal while Markel Susaeta’s drive forced the leaping Ter Stegen into an acrobatic save. Barcelona settled into the game but were never in control. Still, they twice should have scored, with Messi and Suarez both guilty of missing. First, Suarez peeled free at the back post but glanced wide from Messi’s cross and then Messi hit the crossbar, the goal gaping after Iago Herrerin had rushed out to intercept Nelson Semedo. The game was frantic and Bilbao were more than holding their own. Raul Garcia’s finish was blocked and Mikel San Jose’s effort whistled inches outside of the post. In between, Barca had enjoyed their best spell at the start of the second half but the gaps always seemed to close around the penalty area and they struggled to find a way through. Dembele replaced Coutinho with just over 10 minutes left but Bilbao had the best chance to win it. Iker Muniain squared for Williams, who looked certain to score after wriggling free of Gerard Pique. Instead, Ter Stegen shot out his right hand, somehow denying the striker from eight yards. De Marcos received a second yellow card in injury-time for a handball but there was no time for Barce to feel the benefit. Bilbao held on.